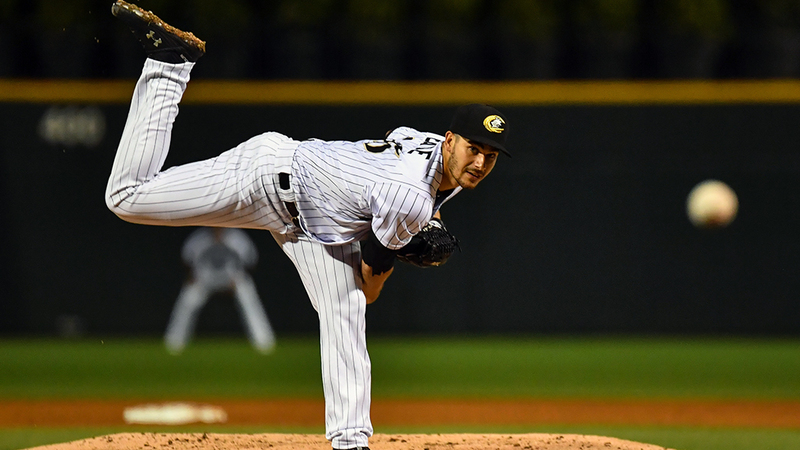 Through three starts this season, Harrisburg righty Wil Crowe owns a 1.69 ERA and is holding opposing hitters to a .189 average. He's looking to improve to 3-0 when the Senators host Altoona. Mississippi's Ray-Patrick Didder successfully bunts with the bases loaded in the 10th to give the Braves a 2-1 win over Montgomery. El Paso's Ty France (16 hits and 17 RBIs in seven games) and Tigers prospect Casey Mize of Lakeland (seven one-hit innings) led the way as Minor League Baseball announced its weekly award winners. Round Rock's Taylor Jones hits his second homer of the game, a no-doubter to give the Express a 2-0 lead in Memphis on Monday afternoon. Dom Nunez recorded his first career three-homer game and Rockies No. 26 prospect Roberto Ramos tied the franchise record with eight RBIs as Albuquerque matched team marks for runs in a game and victory margin. Top-ranked PIttsburgh prospect Mitch Keller strikes out his eighth batter of the game while allowing two hits over six scoreless frames for Triple-A Indianapolis. Luis Robert is day-to-day with a contusion on his left hand. The fourth-ranked White Sox prospect suffered the injury during the nightcap of Saturday's twinbill. Shortstop Carter Kieboom, MLB.com's No. 37 overall prospect, impressed with an .801 OPS across two levels and cemented his place as a Nationals Organization All-Star.